Skills in Jackrabbit - Quick and Easy! Can I use the same barcode scanner for both the clock and the store? Is there a report that prints the secret word field (from the Student Misc tab) for each child? Why is the Student Medical tab missing the Immunization/Medical Requirements? We need more than one Clock open at a time. Is that possible? How can I change or delete a PIN for a staff member or contact? Can I prevent my staff from clocking in early? How do we handle a one time pick up or drop off (example a visiting relative)? The clock does not display the correct date and/or time when opened. Where can I change this? What would cause a student to not show up in the clock for check in? Why isn't a certain Class displaying in the Clock for Students? The Students have a current Schedule for this Class. If a Student has multiple current classes how does Jackrabbit decide what class to display? Why are numbers are being added into the PIN field automatically? Why can't a parent see their balance when clocking in or out? What is the easiest way to share PIN codes with parents? Is there an App for the Clock? When I launch the Clock on my tablet, how do I get rid of the keyboard that pops up and covers the PIN pad? How do waitlists affect the availability of classes? Can a Drop be scheduled in the Portal? How can I have waitlisters affect the availability (# of openings) in a class? How can waitlists be taken into account when showing the number of remaining openings? Can I export clock data into QuickBooks Online? 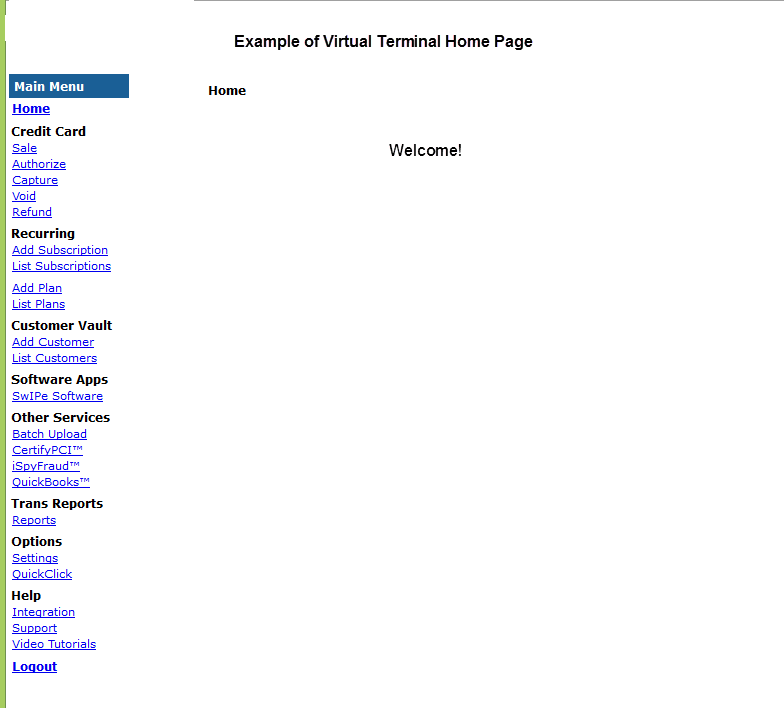 A virtual terminal (VT), or merchant login, is an online access point offered by your gateway provider. The gateway provider will provide you with your virtual terminal login name and will send that information to you in an email which will include a link to set your password. The virtual terminal provides transaction reporting for all ePayments submitted from your Jackrabbit database. This is key in reconciling your bank account. See ePayments & Bank Reconciliation. As well, you are able to control several settings such as the time that your ePayments will be batched and sent from the gateway to the merchant processor daily called the Settlement Schedule. Payments, refunds and voids can also be processed from within the virtual terminal but these transactions are not transmitted back to your Jackrabbit database and would have to be recorded manually. It is a Jackrabbit Best Practice to process all credit card voids and refunds from within your database *. Bank Draft/ACH payments must be refunded through the virtual terminal, this cannot be done from within your Jackrabbit database. * At this time, customers using ePayments in United Kingdom, Australia and New Zealand cannot process a refund directly through Jackrabbit. These customers will see an alert after clicking the R icon on an ePayment. The refund must be completed in the virtual terminal and then recorded in the family's transactions in Jackrabbit. Your virtual terminal can be accessed directly from within Jackrabbit by pointing to Tools and clicking Credit Card/Bank Account Settings. Click the Virtual Terminal button to open the login screen for your ePayment Partner's online gateway access. For questions regarding the virtual terminal and its use please refer to your gateway provider, this is not a Jackrabbit application and we are not able to offer support for it.